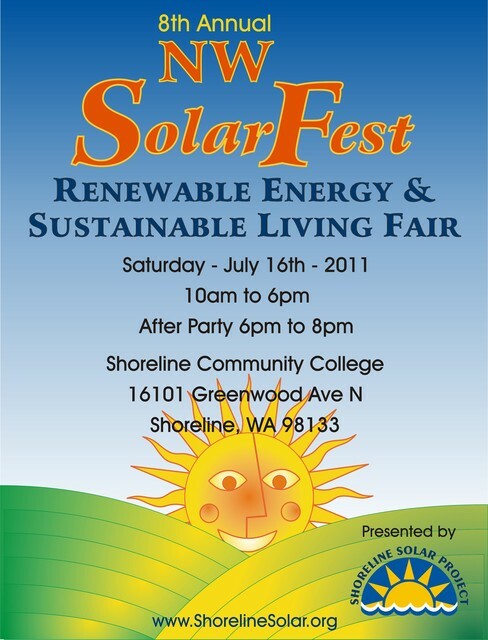 Part of Shoreline Solar Project, NW Solar Fest 2011 is a Renewable Energy and Sustainable Living Fair happening at Shoreline Community College. There will be displays, demonstrations, music, food and a beer garden open until 8 pm. When: July 16th, 2011 from 10 a.m. to 6 p.m. It may sound strange, solar power in the Pacific Northwest, but this renewable energy is becoming more efficient and able to convert energy at lower light levels. Come learn about various new solar technologies including solar cooking and explore other renewable resources at the Zero Energy House.